438 pages | 13 B/W Illus. The first generation that has grown up in a digital world is now in our university classrooms. They, their teachers and their parents have been fundamentally affected by the digitization of text, images, sound, objects and signals. They interact socially, play games, shop, read, write, work, listen to music, collaborate, produce and co-produce, search and browse very differently than in the pre-digital age. Adopting emerging technologies easily, spending a large proportion of time online and multitasking are signs of the increasingly digital nature of our everyday lives. Yet consumer research is just beginning to emerge on how this affects basic human and consumer behaviours such as attention, learning, communications, relationships, entertainment and knowledge. 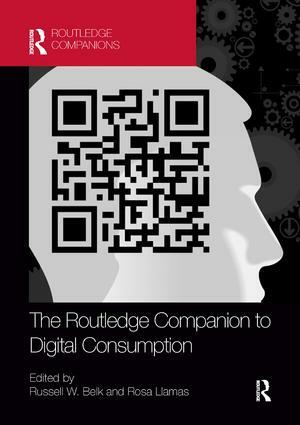 The Routledge Companion to Digital Consumption offers an introduction to the perspectives needed to rethink consumer behaviour in a digital age that we are coming to take for granted and which therefore often escapes careful research and reflective critical appraisal. Russell W. Belk is Kraft Foods Canada Chair in Marketing at the Schulich School of Business, York University, Canada. He is past President of the International Association of Marketing and Development and is a Fellow, past President and Film Festival co-founder of the Association for Consumer Research. He also co-initiated the Consumer Behavior Odyssey and the Consumer Culture Theory Conference. He has received the Paul D. Converse Award and the Sheth Foundation/Journal of Consumer Research Award for Long-Term Contribution to Consumer Research.His research involves the meanings of possessions, collecting, gift-giving, materialism, sharing and global consumer culture. Rosa Llamas is Associate Professor of Marketing at the School of Business, University of León, Spain. Her research interests include the meaning of luxury, materialism, transformative consumer research and global consumer culture. Her work is often cultural, visual, qualitative and interpretive and has been conducted in varied cultural settings. Routledge Companions in Business, Management and Accounting are prestige reference works which provide an overview of a whole subject area or sub-discipline. These books survey the state of the discipline including emerging and cutting edge areas. Providing a comprehensive, up to date, definitive work of reference, Routledge Companions can be cited as an authoritative source on the subject. Edited by an array of highly regarded scholars, these volumes also benefit from teams of contributors which reflect an international range of perspectives. Individually, Routledge Companions in Business, Management and Accounting provide an impactful one-stop-shop resource for each theme covered. Collectively, they represent a comprehensive learning and research resource for researchers, postgraduate students and reflective practitioners.